The Fort Myers Division does not have staffed Bankruptcy Clerk's Office. The District Court's Clerk's Office at the Fort Myers Courthouse does not accept filings in bankruptcy cases. Bankruptcy petitions and other papers filed by parties without an attorney MUST be filed by hand delivery or by mail at the Clerk's Office in the Tampa Division, located at 801 N. Florida Avenue, 5th Floor, Tampa, Florida 33602. Take I-75 N. Take exit 138 toward Ft Myers. Turn left onto FL-82 W/Dr Martin Luther King Jr Blvd. Turn right onto Monroe St. Destination will be on the right. Take I-75 S. Take exit 141 to merge onto FL-80 W/State Rd 80 W toward Ft. Myers. Turn left onto State Rd 80 W. Turn left onto Main St. Take the 1st left onto Monroe St. Destination will be on the right. Click here for a road map of the courthouse. Click here for the staff phone list. The Courthouse does not have a public parking facility. 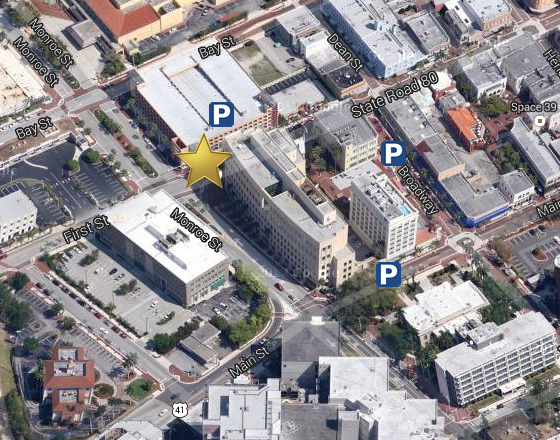 Parking is available at the City of Palms parking garage located across First Street from the courthouse. Parking is also available on side streets surrounding the courthouse. For more parking information, click here.